space on the phone. Earning rewards has never been this interactive and rewarding! 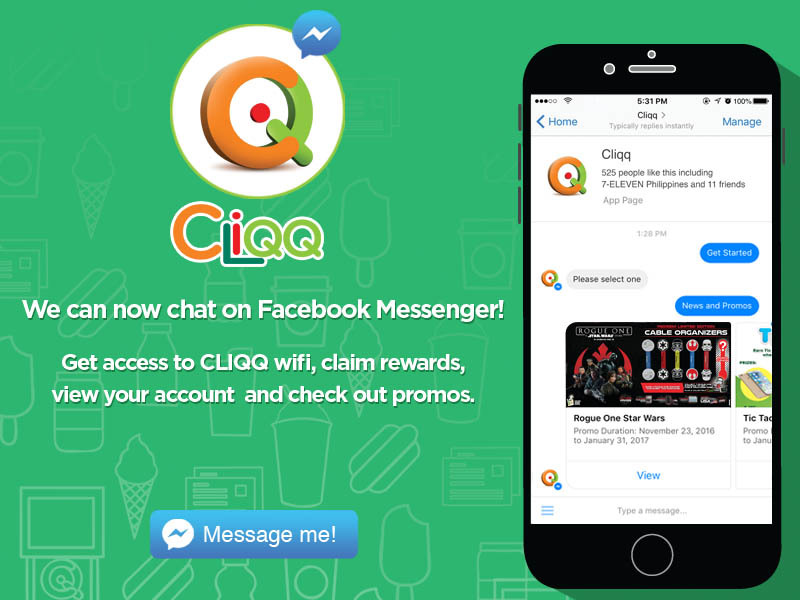 CLiQQ, 7-Eleven’s loyalty program, is the first rewards program in the country to be accessible on Facebook Messenger. No data plan? Always searching for the nearest wifi hotspot? CLiQQ is here to save the day! All you have to do is search CLiQQ on Messenger to access CLiQQ Wifi at any 7-Eleven store. It’s a hassle-free way to stay instantly connected, browse your favorite sites and access your apps. your phone for another app! By making the CLiQQ loyalty program available on messenger, an app most people know and love, earning rewards has never been easier. New members get 70MB of free data for CLiQQ Wifi when they register their account using their mobile number. Points can also be used to top up data, where 1 point = 1MB. Since every 7-Eleven store in the Philippines is a CLiQQ Wifi zone, customers can easily access the internet by using the WiFi feature and connecting to the hotspot. To connect, simply turn on your phone WiFi settings and connect to CLiQQ WiFi hotspot. barcode generated by CliQQ on messenger every time they buy at 7-Eleven. Every P50 worth of purchase earns you a point. Points earned can be used to redeem products on the rewards catalog. raffle promos. Not only that, CLiQQ on Messenger now makes it easier for customers to transact, all with a CLiQQ of a button. It’s so easy! Update your profile, check your balance and current points, view the latest reward catalog, and redeem all inside Messenger. Never miss out on points again by having your CLiQQ barcode on your phone when you visit 7-Eleven. Stay connected, stay updated with the CLiQQ on Messenger! Start chatting with CliQQ on Messenger now! For more information, visit www.cliqq.net and follow CliQQ on Facebook (facebook.com/cliqq.ph) and Instagram (instagram.com/cliqq_ph).